I previously mentioned that I’m now volunteering at the KPNWR (Kilauea Point National Wildlife Refuge). I thoroughly enjoy working being there. I’m learning so much from the rangers, and have such fun conveying all that I learn to the visitors. One of the privileges of being a volunteer is that we get to attend the monthly meeting…a couple of hours on a Friday morning. The first half of the agenda is an established sequence of updates, to keep us all up-to-date with what’s going on at the refuge, including a biological report…whatever’s happening depending on the time of year (currently, the wedge-tailed shearwaters have hatched a few weeks ago and are growing, and the Newell Shearwaters are approaching their fledging season); followed by, among others, an update from the KPNHA (Kilauea Point Natural History Association) which runs the Visitor’s Center. 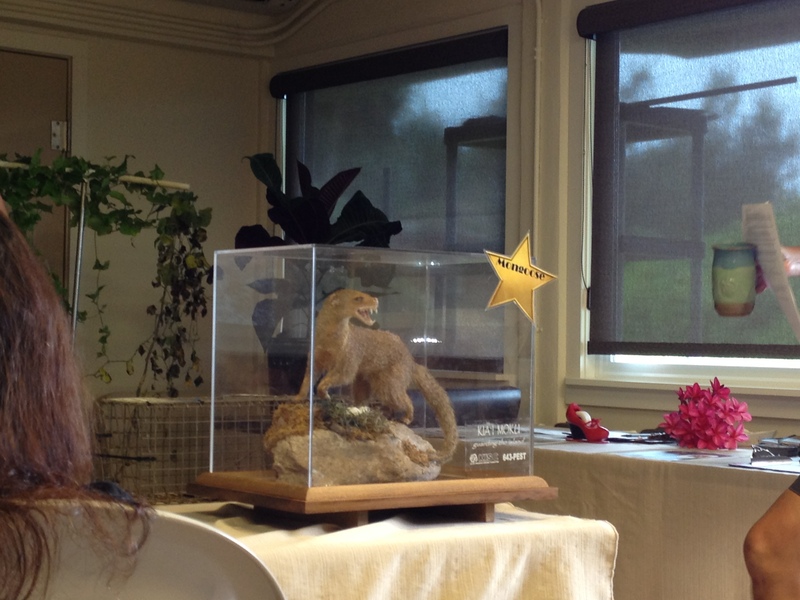 After those various reports, for the second half of the meeting we’re treated to a “Featured Nature Nugget” speaker. 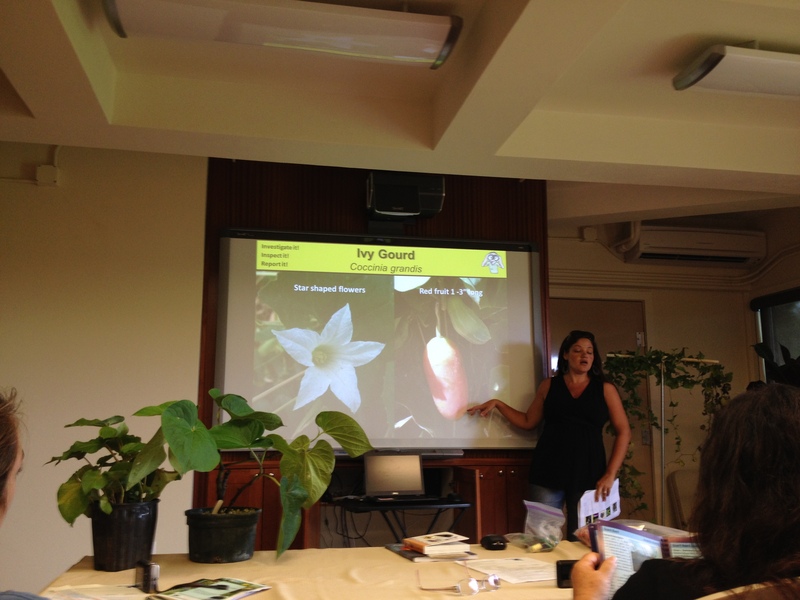 Today, three members of KISC (Kauai Invasive Species Committee) joined us, to discuss the invasive species on Kauai and how to recognize them. Tiffani Keanini fascinated us with her talk and samples. Our main interest was the mongoose (a truly vicious looking b*stard), since we’ve been hearing of several sightings and a couple of captures in recent months, and they would be a particular threat to our ground nesting birds and hatchlings if they were to establish a colony on this island. However, we also learned of several plants that threaten the environment in a number of ways. The Ivy Gourd is the vine standing on the far right behind the speaker. Its flower and seed pod are shown in the slide. For example, Pampas Grass (well known to my California friends) is a big no-no here. Apparently, some well-meaning but naïve homeowners have tried to plant them in their yards. However, I’m now on the case … looking for any further PG occurrences. Other examples were the Ivy Gourd (“regarded as very invasive and on the Hawaii State Noxious Weed List”), plus another vicious, but teeny critter, the Little Fire Ant, which was inadvertently transported from South America and made its way to the North Shore of Kauai via a landscaping company working on an individual homeowner’s yard in the area. A good reminder for me was how seeds can be spread inadvertently by hikers. KISC pleaded with us to brush off our boots whenever we’ve been for a hike, to avoid spreading the seeds of one species (particularly an invasive species) from one part of the island to another (which reminded me of a trip to the Galapagos Islands with a good friend back in 2002, when we diligently washed off our boots, snorkel equipment, etc., whenever we left one island to go to another). Gotta love the KISC guys who provided us all with free boot brushes, as well as key rings and fridge magnets, to try to spread the word. Heads up, any keen hikers who comes to visit us! From now on you will definitely be subjected to the boot brush!